I have a minor obsession with this area of Romanov/Russian history. And yes, it was brought on by 1997's Anastasia. Since then, I have read a few biographies, a couple of articles, and became once again enraptured with this family in 2007 when the remains of Anastasia (or Marie) and Alexi were found. When given the opportunity to read The Family Romanov: Murder, Rebellion, and the Fall of Imperial Russia by Candace Fleming, I knew I couldn't pass it up. Each time I read a biography I always learn something new and Candace's book was no exception. What I truly loved about The Family Romanov is that Candace doesn't just focus on the Romanov family, she also talks about the state of Russia and her people. Knowing what was going on outside of the Romanov family is eye opening as I understood where its citizens were coming from and why they wanted to overthrow Nicholas II and the monarchy. Sometimes I have trouble with non-fiction novels. I start out excited to read it and learn about these people, but then after a while I feel like I'm being taught by Ben Stein from Ferris Buller's Day Off. With The Family Romanov. With The Family Romanov, I had zero problems. Candace's writing is wonderfully done and doesn't give the book a feeling of non-fiction. I didn't feel like I was being taught, I felt like I was reading a fictional narrative. I was entranced, engaged, and looking forward to turning the page. For any individual interested in the Romanovs, I highly recommend this book. 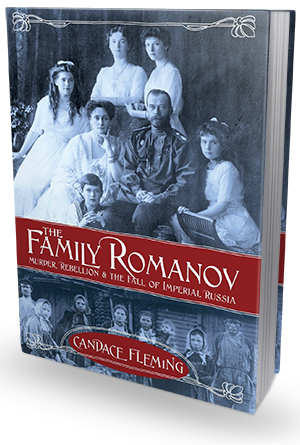 Since Candace focuses on both the family and Russian history, know that going into you're not going to learn a lot about the familial relationships and what they are each going through specifically as she balances her narrative equally between the Romanovs and Russia. She does touch on the Grand Ducheeses and Alexi, but most of her focus is on Nicholas and Alexandra. For me it wasn't a huge deal as I know a lot of the family, but someone who doesn't know so much may be a little disappointed. However, knowing/understanding what the Russian people were going through was exceptionally enlightening in understanding this period of history. Incredibly researched, The Family Romanov is a must for anybody interested in this period or anybody looking to get their toes wet. Even for those who have trouble trudging through facts, I know you'll enjoy this book. I learned so many things and experienced so many emotions - this is by no means an easy read, but it is a read that has stuck with me.